A Luxurious, All-Inclusive Beachfront Resort on the Pacific Coast. Couples, families, and groups who want to stay at an all-inclusive beachfront resort. Experience Hollywood’s glamorous lifestyle and luxury. 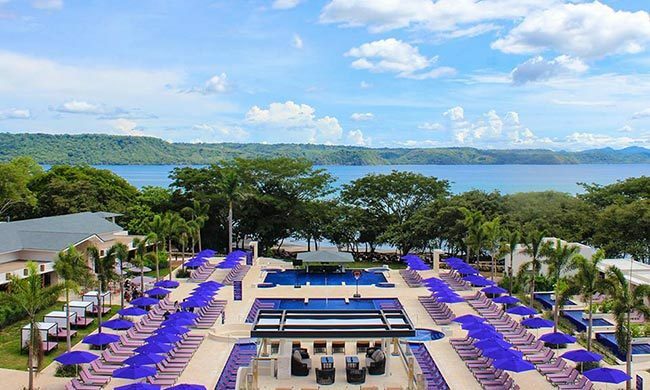 Located on a beachfront property in Papagayo, Guanacaste, Planet Hollywood offers modern designs and expansive views in one of the best all-inclusive hotels in Costa Rica. With well-furnished facilities, themed activities, and varied restaurants, this resort is perfect for vacationers of all ages. Enjoy world class service and attention in the comfort of this gorgeous oasis. All-inclusive luxury. From rooms to restaurants, this hotel welcomes you with upscale decorations. On-site entertainment. Daily and nightly, variety shows and music are available in dedicated areas. Fine dining. Seven specialty restaurants are located on the property to satisfy your cravings. Boutique feel. Although it offers privacy on each room, Planet Hollywood is a brand resort which attracts multiple visitors each year. Adults only. This place is good for both adults and children, with planned activities and areas for both. Direct contact with nature. With easy access to the near bay, Planet Hollywood focuses on indoor comfort. Surrounded by the dry tropical forest, Planet Hollywood is one of the few real all-inclusive hotels in Costa Rica. It’s right in front of Culebra Bay (meaning Snake Bay), with calm waves and turquoise waters you can easily access from the resort. Characterized by its attention to detail, this hotel is also conveniently located a 30 minute drive from the Liberia international airport. It offers worry-free, all-inclusive stay in a themed hotel that combines the best of Hollywood and Costa Rica. Kick back and relax. Admire the ocean view while lounging at the pool. Visit the restaurants to look for new flavors or old favorites, and, if you are an adventurer, go out to explore the area in a guided tour. The beach is also a perfect spot to swim and practice water sports. Whether you want a quiet stay or to pump it up, Planet Hollywood is a great place for everyone. From the beginning, your experience at Planet Hollywood is designed to make you feel like a star. Rest assured you don’t have to reach for your wallet every time you want something, and enjoy the gorgeous furnishings in your rooms. It might be difficult to choose, but be prepared to say which is your favorite movie. Upon arrival, the front desk requests this detail so once you reach the room, the film’s soundtrack is playing in the background. There’s no better way to get in the right mood. Rooms are full of well-appointed details. Enjoy the handcrafted mattress and bedding, designed specifically for the hotel. If you wish to take a nap during the day, or sleep in the next morning, there are convenient black curtains to block any unwanted light. Top notch entertainment equipment is also available, along with high speed WiFi. For easier management, download the PH Mobile app to keep up with all aspects of your stay right on the palm of your hand. Discover unparalleled attention with the 24-hour room service and get everything you want from the menu. Admire Papagayo Gulf from a private balcony, or lounge at the Jacuzzi to disconnect from the world. Upgrade your stay and become a Star Class resident to get even more pampered. Gain exclusive access to The Green Room lounge and bar, complimentary sessions in the hydrotherapy pool, and more. Hollywood is all about luxury and enjoyment, and this resort does not disappoint. With themed facilities and restaurants, the experience is full of authentic memorabilia from the film industry we all know and love. Whether you want to spend your days resting or keeping up a rigorous exercise regime, Planet Hollywood has made sure to cover all your needs. To keep your heart pumping, the PH Fitness Center has the latest equipment. Assist to daily classes, all of which vary during the week, and break a good sweat. Not a fan of classes? Come by yourself, pull weights and run some miles. It’s all part of your all-inclusive stay. Alternatively, fight Costa Rican heat with the help of water. Relax at the big front pool while admiring the view, or plunge into it to play with your kids during the afternoon. Head to the splash pad to enjoy water slides and other games. To completely unwind, however, sit at the hot tub with your favorite people at night. Discover another level of peace under a starred sky and the sound of ocean waves. In addition, every day there is live entertainment by the pool as well, so you can watch while swimming. At night there are also shows you can attend, so make sure to check out the program! Bringing the kids? There is plenty for them to do at Planet Hollywood, with activities planned exclusively for them. The Starlets Kids Club it’s a perfect opportunity for the little ones to meet other kids and play to their heart’s content. Every day there is something to do: dance parties, art classes, gym exercises, or themed events. Every week there are awards ceremonies for the friendly competitions held at the club, which is also full of age-appropriate toys destined just for them. Kids can run free without the danger of bothering anyone, and you can relax knowing they are safe and entertained. One of the great appeals of all-inclusive hotels in Costa Rica is their food. With a good balance of both local and international delights, Planet Hollywood offers unique variations for traditional favorites. The buffet is open for all three meals of the day, so you can go and enjoy all you want to eat there. However, there are also seven specialty restaurants. The East offers Asian food, and has a sushi & teppenyaki bar for when you want something adventurous. For those inclined to more hearty meals, the Sunset Strip is an excellent steakhouse with tender meats cooked to perfection. The on-site Tex-Mex cantina, Blue Star, offers an unparalleled cowboy ambiance along with their food. In the mean time, the So Cal gourmet emporium provides a more glamorous experience, deserving of Hollywood’s California. If a big event is coming up, the OverTime sports bar is available for beers and excitement. Don’t miss any of the important games, and join in the celebration. In a different tone, Gusto has the best pasta and Italian food you can try. And in the spirit of celebrating fame, Guy Fieri’s Burger Joint offers its delicious burgers with carefully chosen ingredients. Either peckish, thirsty, or hungry, Planet Hollywood offers a good variety of meals in its all-inclusive plan that can satisfy even the more demanding. Some of the options the resort offers are not included with your stay, but they are accessible should you want them. The souvenir shop is open for all your smaller needs. Branded merchandise, as well as travel essentials, can be bought here. Find inflatables, beach bags, sunscreen, after-sun lotions, and more. So if you forget or run out of something, there is no need to worry where to get it. The PH Spa & Beauty Bar is also a special treat. It is not included with your stay, but it presents a perfect blend between Costa Rica’s green attitude and the Golden Age of Hollywood. It also uses renown organic brands which are committed to preserving the planet. Rest assured you are both taking care of yourself and the environment. Lounging by the pool can become even more satisfying if you rent a cabana. This is a private sitting area, equipped with mini bar and waiter service. Enjoy luxury and comfort all in one, while still taking maximum advantage of the ocean views. To those more adventurous, there are plenty of opportunities to explore Costa Rican nature. Go on a tour around Papagayo Gulf and discover the local flora and fauna that thrives in the area. Learn about the rich biodiversity in the peninsula while experiencing some adrenaline. Certainly, Planet Hollywood combines the best of Costa Rica’s natural beauty with great service of international standards. Whether enjoying the hotel or going out to explore, Planet Hollywood is a must for those who want to see the best of all-inclusive hotels in Costa Rica.